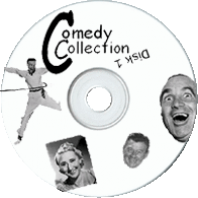 "Movie On Fred Allen's Life"
This comedy collection includes a single episode from every current OTRCAT comedy show. There are so many laughs in this collection that your belly will ache for weeks. All the big wigs are included, such as Bergen and McCarthy, Amos and Andy, Bing Crosby, Bob Hope, Burns and Allen,Fibber McGee and Molly, Fred Allen, Jack Benny, Jimmy Durante, the Marx Brothers and more! Tune in to Al Jolson as he hosts The Kraft Music Hall, guest starring Red Skelton. Can't get enough of Red? Then travel on to Avalon, where Red hosts The Avalon Hour. Tune in to A Date with Judy, guest starring old Blue Eyes, in a story where Judy goes with Ruby to see a Frank Sinatra movie.Or Abie's Irish Rose, about the young newlyweds from differing backgrounds, Abie and Rosemary Levy, who make a New Years resolution to stop fighting. Will it work? Then there's the rare Al Pearce Show, where Al plays a door-to-door salesman that tries to pawn off a slew of hot dogs. Will the customers bite already? Join in on the laughs with family situation comedies, such as the Aldrich Family in an episode where they eat grouse for dinner and have a burnt pie incident. Or listen in on the Anderson Family as they argue about how to kick a football. Then there's Charlotte Greenwood, where Auntie Charlotte raises three children on her own, with hilarious results! There's also such classics as Father Knows Best or The Hardy Family, with goofball Mickey Rooney. Other classics include The Great Gildersleeve, which was radio's first bona fide spin-off where oddball Throckmorton P. Gildersleeve moves from the home of Fibber McGee and Molly to his own program. In this collection, you'll hear many famous comedy duos, such as Bob and Ray and their hilarious ad-libbed patter, the dimwitted duo Laurel and Hardy and the zanyman-crooner duo, Martin and Lewis. There are also plenty of husband and wife duos, such as Ozzie and Harriet, and the Easy Aces, about a realtor and his kooky wife. Then there are the shows that are about life - Life with Luigi, about a gentle Italian immigrant, Life with Riley, about an aircraft plant blue-collar worker, his family and their neighbors, and Life with the Lyons, with a real life family playing themselves on the air. Life is often good when you're at Duffy's Tavern, a place in New York where guest stars are always dropping by for a drink. Other comedy shows have interesting themes, such as those that correspond to the comics. There's Archie Andrews and his crazy friend Jughead, Blondie, with Dagwood and his gigantic sandwiches, and Gasoline Alley with Skeezix. Then there's the Comic Weekly Man, a one-man show where Comic Weekly Man sings a ditty about himself and dramatizes the weekly comics using his personal collection of crazy voices. Other novelty series include such gems as Candid Microphone, a forerunner to Candid Camera. There's also Arthur Godfrey, a comedy and amateur talent show, where Arthur searches and evaluates budding stars. See how smart they aren't on It Pays to Be Ignorant, the baffoon's version of a quiz show with humorously idiotic judges and ensuing chaos. Also, you'll have a few stars in your eyes and more in your ears when you hear Hollywood is on the Air, which brings short previews of newly released movies. And don't miss The Jack Haley Wonder Show, played by none other than the tin man himself. You won't want to forget the fine females of comedy. These are no damsels in distress, they can really give you a run for your one-liners. They are Barbara Stanwyk, who doubles as a dramatic actress and guest stars on Bergen and McCarthy , Carmen Miranda, Beulah, Irene Dunn, "Hollywood's First Lady, in Bright Star, Joan Davis, with her squeaky door vocal cords, as Judy Canova, who started the pigtail and calico fad at college campuses across the country, and the grand lady Kate Smith in The Kate Smith Show. If you like a side of music with your laughs, you'll enjoy listening to those who can really dish it out - Billy Jones and Ernie Hare as The Easy Loafers, promoting their delicious Taystee Bread. Another musically delightful duo is Les Paul and Mary Ford, who drum up laughs and good music in their fun old time radio show. It sure keeps Mary Ford giggling! Bob Burns also calls for laughs with his crazy homemade bazooka instrument, and often features the music of Spike Jones on his own Bob Burns Show. Spike Jones also had his own program, The Spike Jones Show, full of musical hilarity. Be the first to comment on "Comedy Collection"
Round the Horne The Spy Who Came in from the Cold.